Today, we have submitted a new paper on the formation of the first metal-enriched stars. We concentrate on the scenario where an external supernova blastwave enriches a nearby halo to 1/30,000th of the solar metallicity, sparking the gravitational collapse of the gas that can cool through molecular hydrogen formation on newly-formed dust grains. See the movie below for a full tour of the simulation’s evolution. The First Pop II Star from Britton Smith on Vimeo. This work significantly improves on previous efforts that only considered non-cosmological simulations or a uniformly enriched medium. Our simulations include coupled radiative feedback from Population III massive stars and their supernova, following the metal enrichment from the explosion site to the subsequent star forming region. 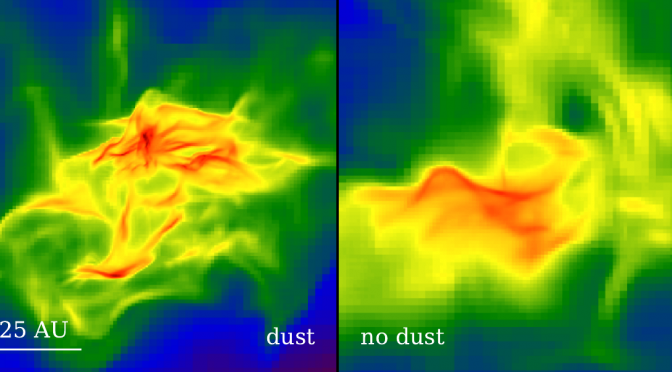 We find that cooling through dust grains enhances fragmentation during the collapse, suggesting that the most metal-poor stars are the result of incomplete mixing. For more images and details, see Britton Smith’s webpage on the paper.